I-Kuan Tao Followers - What many I-Kuan Taoists are there? Where do they live? The I-Kuan Tao movement claims to have about 2 million members around the world. I-Kuan Tao originated in China. However, since the religion is proscribed in the People's Republic of China, it is difficult to estimate the number of adherents in that country. I-Kuan Tao has flourished in Taiwan since the 1970s, even though it was banned in that country too, until 1987. 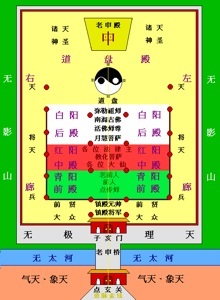 A survey in 2002 resulted in the figure of 845,000 I-Kuan Tao adherents, and 3,100 temples, in Taiwan. I-Kuan Tao is believed to be the third most popular faith in Taiwan (after Buddhism and Taoism). The World I-Kuan Tao Headquarters was established in the United States in 1996/A>.